One goal of Stick Camp Canada is to have a performance every day. This year, one of our performances will be at the Farmer’s Market on Gabriola Island near Silva Bay. This will be an “open mic” format so everyone is welcome to play a couple of tunes. Dirseus Hache leads his group’s performance at the Surf Lodge, 2018. Absolutely! Everyone attending is encouraged to perform. 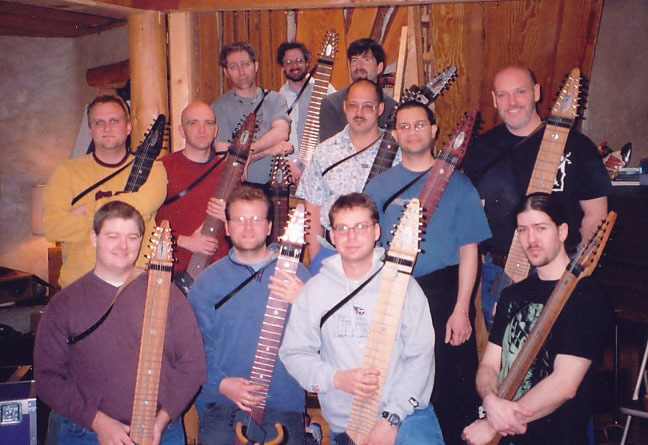 And if you have never had a live Chapman Stick performance before – no problem! 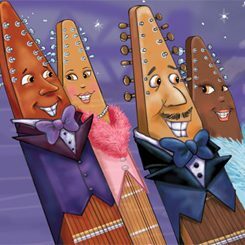 One of the advantages of working in groups is to be able to perform with a group – a much less daunting task than solo performance, especially if it is other Stick players helping out. Our very first island retreat, on nearby Saltspring Island in 2003, was special not just for the hexagonal, straw bale and adobe lodgings, or the on-site, free-range chickens, who were kind enough to lay enough eggs for our breakfast each morning, but also that, at our Sunday evening concert, next to the giant quartz crystal, half of the music performed had been written that weekend, mostly with the help of Stickmaster Greg Howard. Our first island retreat to Saltspring Island in 2003. Bob Culbertson’s group performance at the Surf Lodge, 2018.